The design of the R-27 missile was started in April of 1962 and was intended for the Pr. 667A SSBNs which could carry 16 of them. Complex D-5 was accepted into service in May 1968. R-27 was similar in construction to previous missiles but had almost double the range. This was the first Soviet submarine ballistic missile not to use fins, which substantially reduced the size of the launch tubes. It was also the first one to have an inertial navigation system, which allowed it to be much more accurate. Maximum trajectory height was 339 nm (620 km). This missile required eight minutes to be prepared for engine start and could be launched at 8 second intervals from depths of 130 to 165 feet (40 to 50 m). There was also a possibility of two 8 missile launches. A design effort to fit this missile with MIRV warheads began in 1970. The modified missile was designated R-27K and one Golf I class submarine was converted into the Pr. 605 (Golf IV) with 4 missiles. Trials lasted for seven years due to difficulties with the MIRV warheads. The submarine was accepted into service, but no other boats were converted due to the entry of the Pr. 667A SSBNs into service. 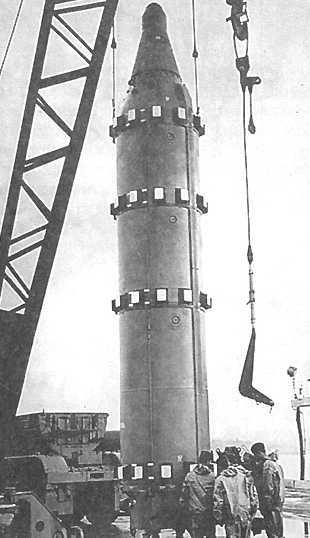 This design was refined into the first successful Soviet subarine-launched ballistic missile with MIRV warhead. This was designated as R-27U (also known as RSM-25), which was designed in 1971-72 and tested in 1972-74. This new missile could cary either three individual warheads or a single heavier warhead. Complex D-5U with R-27U missiles was accepted into service in January 1974. This missile could be launched from depths of 140 to 160 feet (42 to 48 m) at speeds of up to 4 knots. In the period between 1974 and 1990 161 missiles were launched with a 93% success rate.